This charming print depicts the opening of the new London Bridge by William IV on August 1, 1831. Spectators may be seen watching the event from boats, doffing their hats to the King as splendidly decorated barges pass beneath the arches of the new bridge. In the distance, the old London Bridge, Monument and the spire of St Magnus the Martyr are all visible.By the end of the eighteenth century it had become clear that London Bridge, which dated to the reign of King John, would have to be replaced. It took years to decide upon a suitable design for the new bridge, however, and it was not until 1831 that John Rennie’s bridge was completed. King William wished the occasion of its grand opening to be properly commemorated; already an admirer of Clarkson’s work, he commissioned him to execute this painting, along with The Entrance to Portsmouth Harbour. 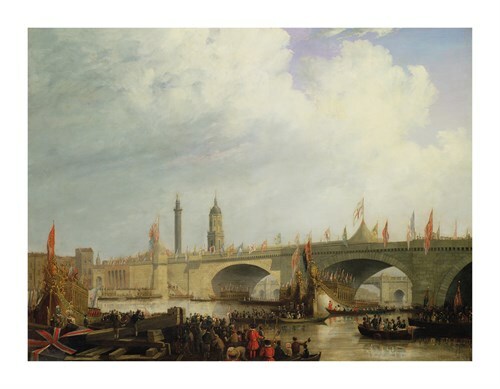 It currently resides in the Wakefield Collection of the Guildhall Art Gallery.This incarnation of London Bridge was built over seven years, beginning in 1824; it is estimated to have cost around two million pounds to construct. The bridge was to remain in operation for well over a hundred years; but in 1924 it was discovered that the widening of the bridge twenty years earlier had left its foundations unable to support it. Rather than launch a costly repair operation, the Corporation of London decided that the bridge should be sold; the winning bid was made by the American entrepreneur Robert P. McCulloch, who installed it in its current location in Arizona having moved it, brick by brick, across the Atlantic. It was rumoured that McCulloch had in fact wanted to buy the more celebrated Tower Bridge, but he always denied this, singing the praises of the historic structure whose majesty is done full justice in this superb print. Clarkson Stanfield was born in Sunderland in December 1793, the son of the Irish writer, James Stanfield. He originally began working on a ship, where he painted occasionally, but in 1818 he decided to become a painter full-time. He moved to London where he studied and spent some time as a theatre decorator, whilst still painting small marine scenes. He exhibited at the Royal Academy in 1820, and joined the Society of British Artists in 1824. In 1829 he painted his last theatre set and concentrated on painting full-time. In 1839 he travelled to Italy, France, Holland painting coastal marine scenes, which he portrayed in a very delicate, sensible style.